Here's an interesting article Were they right? Great Thinkers of 1931 Predict What 2011 Will Bring from ABCnews.com. In the article, Tim Mack (President of the World Future Society), looks back on the predictions from American "geniuses" from 1931.
a change from 35% of American homes being heated by wood fires to people living in "an electrically heated, air-conditioned home"
the magic of remote control would be "commonplace"
So - what about 80 years from now in 2091? 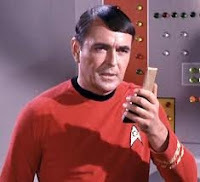 Will we be able to say "Beam me up Scotty" like in Star Trek? What will the iPhone v123 look like? Will people laugh at the idea of only having 1,000 TV stations? Will the recession in Ireland be over? Will Eugene still be blogging? How many users will Facebook have? Probably only those under the age of 40 right now will live long enough to find out - Tim Mack predicts that people will live longer, up to 120 years. Most babies born around now in "developed countries" can expect to be alive in 2091. In our family we will be celebrating my Dad's 80th birthday on 31st March next. It will be interesting to get his reflections on the past 80 years since he was born in 1931, as well as his thoughts on the next 80. I'll be sure to blog about this.